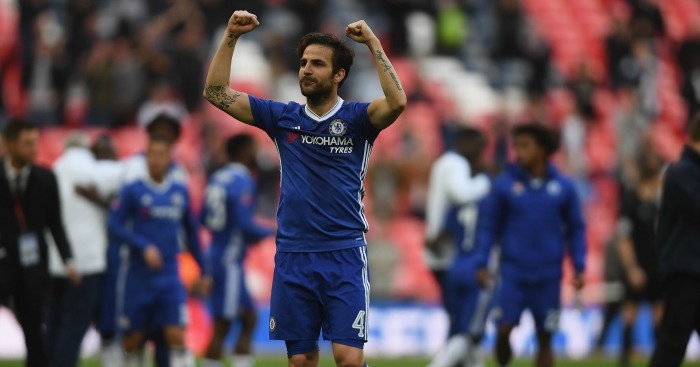 Cesc Fabregas reminded everyone of his quality yet again with a commanding performance in Chelsea’s 3-0 victory over Middlesbrough at Stamford Bridge on Monday. Fabregas has had to settle for limited game-time under Antonio Conte, but he has been excellent whenever he has been called upon and recorded two more assists as Chelsea relegated Boro. The 30-year-old was linked with a January move away from the Londoners but suggests he has played some of the best football of his career this term. “It’s not easy what happened to me,” he said. “Many people told me I’m not the type of player for Antonio, told me I should leave, but I like challenges and this was a big challenge. “But I feel the quality of my minutes whenever I’ve been on the pitch have been fantastic so maybe my contribution has been even bigger than when I’ve played more in other seasons. And judging by his statistics for the season and the records he now holds in England’s top flight, Fabregas should be considered a Premier League great. – Fabregas is the first player to record 10 or more assists in six Premier league campaigns. – Fourth most assists in the league despite starting only 11 games. – More assists than Paul Pogba and Mesut Ozil combined, despite playing 3,924 minutes less than the duo. – Played only the 13th most minutes for Chelsea in the Premier League this season but has been directly involved in exactly a fifth of their goals (11 assists, four goals). – Joint record for most assists in a single Premier League match with four (Arsenal v Blackburn, 2009). Cesc Fabregas is the first player with 10+ assists in six different Premier League Seasons.